Dubai: Dubai Internationals’ burgeoning passenger traffic is unlikely to force a knee-jerk reaction to fast track the move to the newly opened airport in Dubai World Central (DWC), analysts say. Last week Dubai Airports released January to November 2013 passenger growth figures for Dubai International. 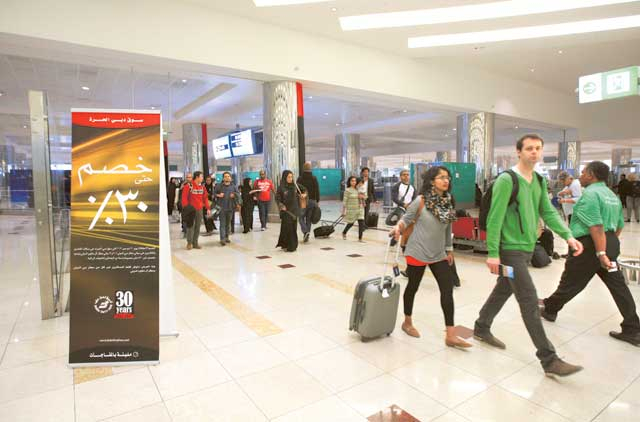 From January to November 2013, 60,384,407 passengers arrived, departed, and transited through Dubai International compared to 53,363,589 in the same period in 2012. The 15.3 per cent increase is more than double the 7.2 per cent passenger growth forecast in Dubai Airports Strategic Plan 2020 that was released in 2011, which states that over the past 50 years passenger traffic has increased at an annual average of 15.5 per cent. But Dubai International is not feeling the pressure. At the beginning of 2013, Dubai International opened Concourse A increasing its total capacity to 75 million passengers a year. By 2018 capacity its will increase to 90 million a year.Increasing passenger traffic is partially being driven by Eastern Europe and Australasia, which in November 2013 had 56.5 per cent and 33.4 per cent respective passenger growth. Dubai Airports attributes this to flydubai’s network of European destinations and the Qantas-Emirates partnership. David Bentley, Principal at UK-based aviation consultancy Big Pond Aviation, told Gulf News that while Dubai Airports may be inclined to revisit previous projections, capacity at Dubai International remains ahead of demand by 10 million passengers a year. The opening of Al Maktoum International at Dubai World Central in the fourth quarter of last year has also given management and the airlines room to move. It opened with a capacity of up to 7 million passengers a year and once completed it will be able to handle 160 million passengers a year. Will Horton, Senior Analyst at CAPA — Centre for Aviation, told Gulf News that while in other cities airports were bursting at the seams with airlines racing to leave, Dubai International can still handle the demand. “It is a luxury to have an alternative airport relatively at your disposal since Al Maktoum was planned with foresight,” he said. While airlines are not necessarily rushing to fly from the new airport, the likes of Wizz Air, Jazeera Airways, Gulf Air, and Qatar Airways have all committed themselves. Qatar Airways will launch flights to the new airport this year. The other three have already started. The switch to Al Maktoum International will not be complete until Emirates moves across but that will not happen before 2020, according to previous comments from the airline’s President Tim Clark. John Strickland, Director at UK-aviation advisory JLS Consulting told Gulf News that Emirates will not split its hub between the two airports but it could re-think moving across earlier. “The growth of traffic at Dubai [International] will certainly crystallise the minds of management of both the airport and Emirates with regard to the planning of capacity over the next few years,” he said. The pressing problem, however, is how to handle traffic during runway repairs at Dubai International between May and July this year. The scheduled maintenance will cut the airport’s capacity and while some airlines have already announced changes to their flight schedules over this period, Bentley said that this “may well focus the corporate mind on DWC more than traffic growth does”.